Sek grew up in a small town in India. When he was young, his parents and younger sister left for the U.S., leaving Sek and his older brother Senthil with family for several years before they too emigrated to the United States and found themselves in Pittsburgh, PA. While he attended Wharton as an undergraduate and briefly flirted with a career on Wall Street, Sek quickly recognized his passion was medicine; he trained at Harvard Medical School, followed by internal medicine and cardiology at the Massachusetts General Hospital. 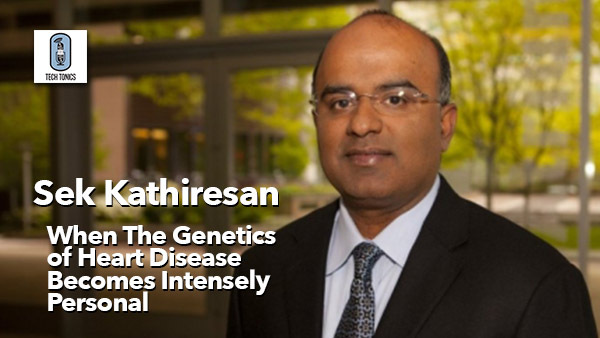 He then found himself captivated by the genetics of coronary artery disease, a passion that was as much personal as professional, as he shares in this episode, talking about how heart disease has affected his family. Sek’s nuanced view of the genetics of complex disease has helped transform the way medicine and science think about these areas; for instance, he’s helped advance the view that diseases may not divide into discrete subtypes (the “fruit salad” model) but may represent (as David described in Forbes) a “gemish, with slight defects in multiple pathways collectively contributing to disease manifestation.” More recently, he’s also developed a polygenic risk score that estimates susceptibility to illnesses such as coronary artery disease (CAD) based on the evaluation of (in the case of CAD) over six million DNA variants. Note that Sek mentioned this website at the Broad Institute during the show. We are thrilled to welcome Sek to our show today! Today’s episode is sponsored by Rockpointe: innovators in medical education and patient engagement.